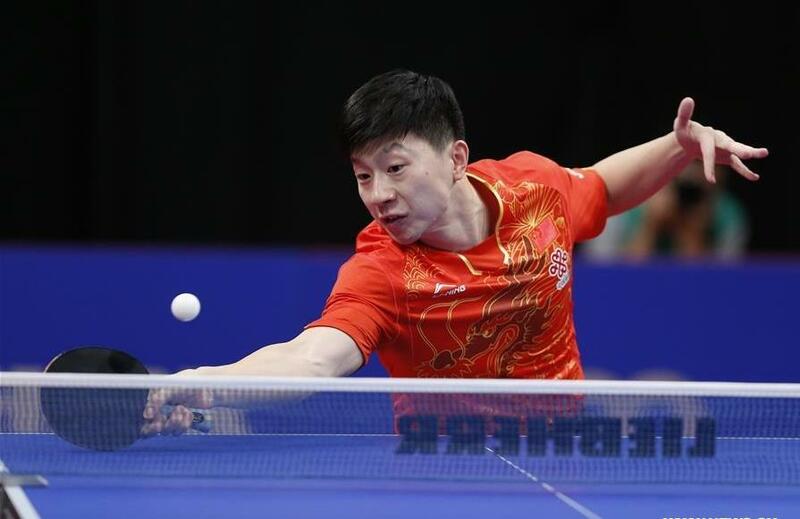 Ma Long made into the ITTF Men's World Cup semi-finals on Saturday, but his young teammate Lin Gaoyuan felt disappointed in a seven-game thriller against German veteran Timo Boll. Ma Long of China returns the ball during the singles quarterfinal match against Niwa Koki of Japan at the 2017 ITTF men's singles table tennis World Cup in Liege, Belgium, Oct. 21, 2017. Ma Long won 4-1. China's table tennis world champion Ma Long made into the ITTF Men's World Cup semi-finals here on Saturday, but his young teammate Lin Gaoyuan felt hugely disappointed in a seven-game thriller against German veteran Timo Boll, something reminiscent of his loss to another Chinese paddler Xu Xin at the World Championships four months ago. After building a three-game lead into the fourth, top seed Ma wasted a 8-3 lead to fall at 11-9, but he managed to seal the victory at 11-8 in the fifth against No. 5 seed Koki Niwa of Japan. "We play many times, and are quite familiar with each other. The most important thing is to do my best on every point," said Ma. "Leading 8-3 in the fourth game, I felt a bit distracted and suffered several errors. I hope that will not happen again in the next match," he added. Ma shrugged off any talk of his personal third World Cup, and focused on every match ahead. "If you want to win the title, you need to play at your best," he commented. The 22-year-old Asian Cup winner Lin let slid a 3-1 lead and six match points in the decider to lose to Boll. Lin sailed to a 11-5 victory in the opening game, before meeting strong resistance from the two-time winner in the second. Lin almost wasted two game points, before regrouping himself to take away another game at 13-11. Lin came back from 9-5 down in the third game with four straight points for 9-all, but Boll got one game back at 11-9. Lin was quite close after uppering in the fourth game 11-9. However, things just went in the opposite way, as Boll forced into a decider with 11-9, 14-12. Leading 10-4 in the seventh, Lin still got the upper hand to the anticipated clash against Ma Long, before Boll strongly bounced back to take six points in a row for 10-all. Lin lost his familiar rhythm, only to surrender the match at 13-11. Lin had every reason to feel deeply disappointed, as Saturday's loss to Boll could bring back some memories about the World Championships round of 16 early in June, where he let slid five match points against Xu Xin. "I might think about that match at some moments, especially when I built a lead," Lin admitted. "I played, to some extent, in a conservative manner when I got the upper hand. I've learnt a lot from this match," he added. "I was really down after one and a half games. I didn't play well, and couldn't receive his serves. At that moment, I thought that I might go down 4-0," recalled Boll. "I'm not happy with that situation. It's an obligation to fight and try because we are sportsmen. Then I received better, and my opponent met some problems in receiving my serves, and the match became quite open," added the tournament winner in Liege back in 2005. Simon Gauzy shocked the fourth-seeded Jun Mizutani of Japan in full games. The Frenchman's opponent in the semi-finals will be Dimitrij Ovtcharov of Germany. The second seed also got past Alexander Shibaev of Russia through seven games.